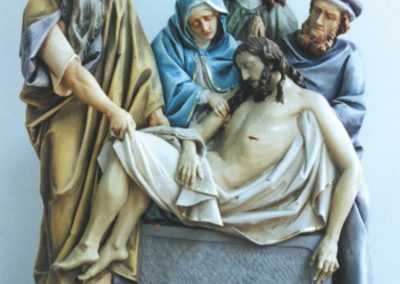 Artists from Conrad Schmitt Studios have cultivated an expertise in restoring Stations of the Cross. In most cases, paint deterioration and damage have occurred, so the improvement in the appearance of the Stations is dramatic. A renewed spirituality is often apparent in the artwork. 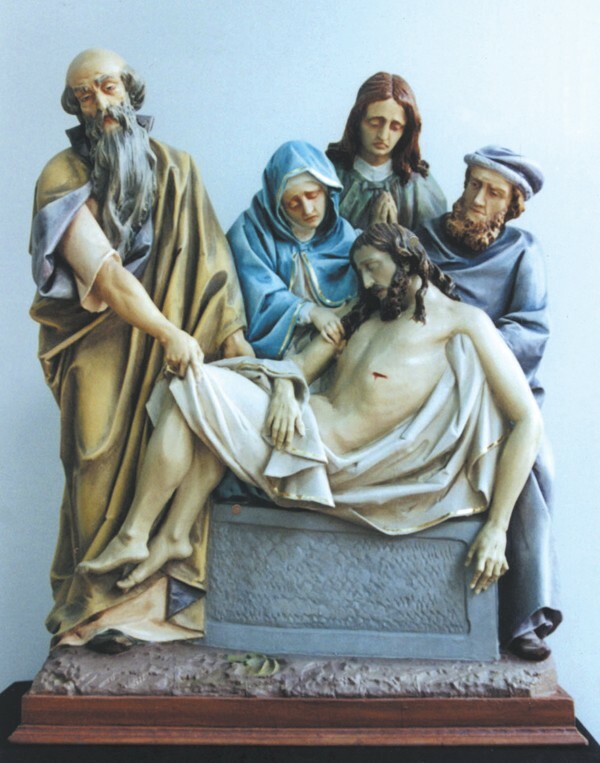 The Stations of the Cross from the Cathedral of St. John the Baptist, in Savannah, Georgia, were restored to their polychromatic state by the Studio. Carved from wood, the statues arrived at the Studio with cracks, missing fingers and peeling paint. Most recently painted in monochromatic tones, they had been painted four different times throughout the years in numerous color schemes. To begin the project, unstable paint surfaces were stripped and smoothed. Then, the missing fingers were carved and securely affixed, and wood cracks were filled. The original skim coating of plaster over the wood was also repaired, as needed. A sealer was applied, followed by the polychromatic painting, which produced colorful garments and realistic skin tones. Layers of glazes were added to provide depth to the sculpting and bring out detail. Finally, missing elements such as a leather whip were recreated. 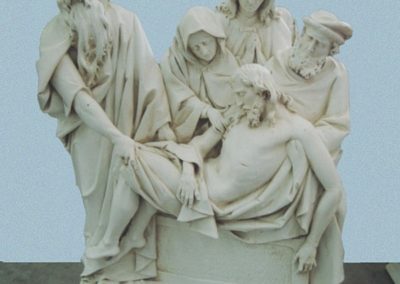 The success of the work was emphasized when a priest visiting the Studio exclaimed that they were the most fantastic Stations of the Cross he had ever seen. 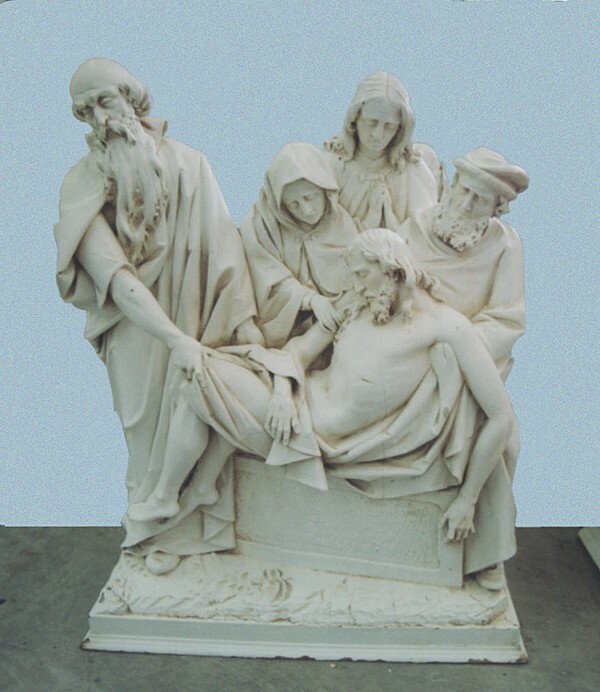 The beautiful work on the statuary was a part of the much larger restoration. Conrad Schmitt Studios researched the Cathedral’s early decoration and created a new decorative scheme that is both sympathetic to the original and reflective of today’s preferences. For the 19th century French Gothic Revival Cathedral, artists from CSS conducted the meticulous decorative painting, which included stenciling, glazing and gilding. Studio artists also conserved and restored twenty-four 1912 murals originally produced by the studio of Paul Gutsche. Restoration of the Cathedral’s stained glass windows was challenging, as more than 4000 pieces of glass needed to be replicated to suit the client’s wishes. The replication of these pieces required extensive glazing and firing to duplicate the originals. These efforts were so successful, that the windows now look exactly as they did when they were first installed. The project culminated with the rededication attended by Catholic dignitaries from around the world.